Julie and Steve Turner welcome you to the Barn House set in Newtown, Mid Wales. Lying south of Snowdonia and east of the Cambrian Mountains in the old county of Montgomeryshire, it is three miles from Newtown on the Tregynon road. 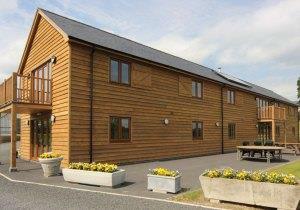 The Barn House caters for large parties of up to 20, extended family gatherings or group accommodation. With five en-suite bedrooms on the ground floor, a large entrance hall, utility room and porch. The first floor has a large open-plan reception lounge, WC, kitchen and dining area. Both ground floor and first floor benefit from under-floor heating. The Barn House is very suitable for families wishing to spend time together, groups of friends enjoying a weekend in Wales, walkers, golfers, car rally teams, shooters, cyclists church groups etc. It is well equipped, spacious and immaculate with tasteful contemporary decor throughout. The Barn House is equally suitable for corporate group functions, training, wedding receptions and conferencing. Accommodation offered in the Barn House is self-catered or semi-catered. Light lunches or breakfast hampers may be provided upon request. Day bookings, single night stays and or multiple nights are available. The Barn House is set in the beautiful Highgate Valley on what was once a prosperous farming estate and has stunning views both up and down the valley. Open all year we can also offer camping in the grounds plus we have 2 cottages (self catering) just across the road. The bedrooms sleep 4 people in either 2 x super king doubles, 4 x singles or 1 x super king + 2 singles. Cots and additional beds can be provided if required.